In 2012, Portland State started an experiment called Electric Avenue. It was planned as a two year study of electric vehicle charging patterns. A one block stretch near the campus was selected and filled with 6 level 2 charging stations, bookended by 2 CHAdeMO stations. The site was very popular with Portland going EV drivers. There were enough stations that you could usually get a parking space and charge up. The parking was not free, this helped ensure that people moved their cars once they had filled up enough to move on down the road to their next stop. When the 2 year shutdown date approached, the EV community asked for the project to be extended and PSU was kind enough to do so; however, they made it clear that this was only a 1 year extension to allow planning for a new location. 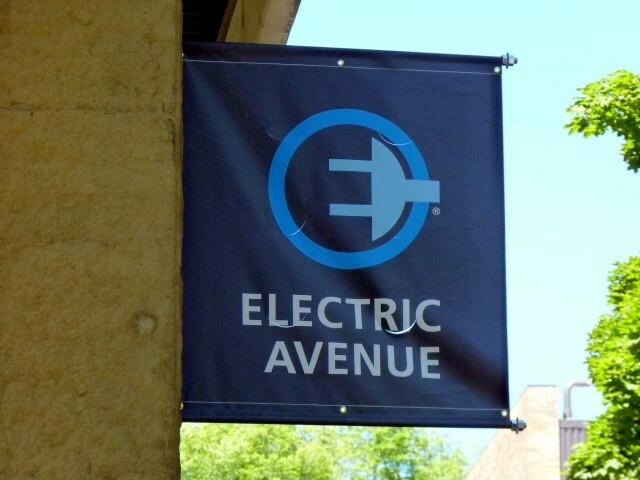 On July 1st, 2015 that one year extension ended and Electric Avenue officially closed. The site was in rather sad shape for much of the final year. The person that had championed for the creation of the project had retired and the fact that it was scheduled for shutdown meant that the EVSE providers were not putting it high on the priority list for repairs. 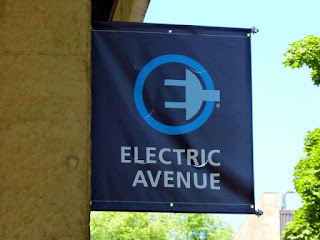 On July 28th, the new Electric Avenue of Portland opens. It will be on SW 1st and Salmon St. near the Portland General HQ. The ribbon cutting is on July 28th at 10AM at 121 SW Salmon St. All are welcome, although the Electric Ave parking spots will be filled with show vehicles. So please plan on other parking locations (or take the MAX). More DCQC spots should improve availability. Anyone know how to remove the old locations from PlugShare?